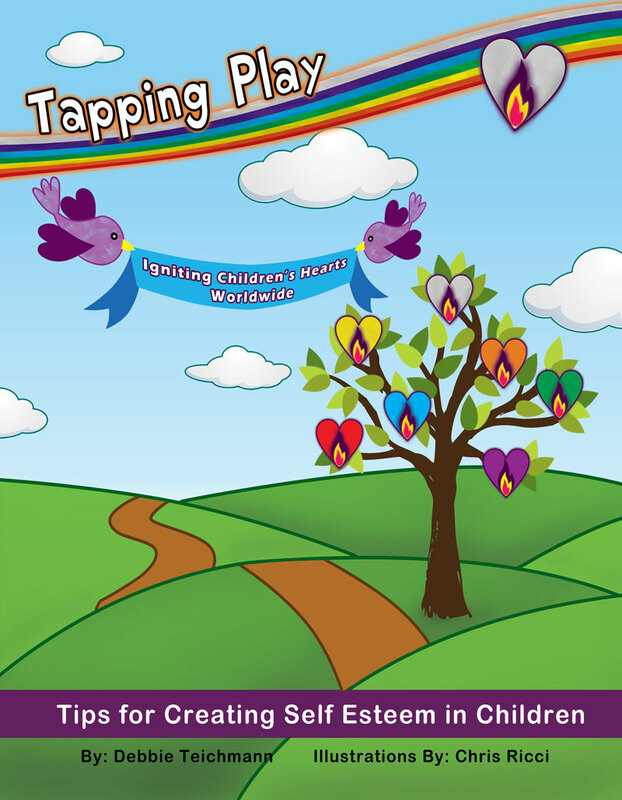 Tapping Play is a line of creative and fun tools designed to calm your beautiful child and ground them in self-love and self-esteem. Annabelle, our free spirited tapping guide and her pals Billy and Franny lead your child through the daily song utilizing Emotional Freedom Techniques(EFT). This daily reinforcement of self-esteem through the act of singing and tapping helps teach your child to love themselves and be able to verbalize it! The 7 songs, one for each day of the week, emphasize positive self-esteem verses, happy thoughts, I AM affirmations, joyful expressions of self-love and happy hugs. These upbeat songs bring happiness and joy to all age groups big and small. Our line of products includes The Tapping Play book, 7 Rainbow Day Songs, Tapping Play Song DVD in both digital (downloadable) and hard copy formats. My 4-1/2 year old grand daughter and I love it! This is an incredible resource for children of all ages and adults as well. Sing and Tap your way to Happiness! Bringing happiness and joy to all age groups big and small. This interactive downloadable gift of LOVE includes our Tapping Play® award winning book (PDF), animated DVD (MP4s) and musical CD (MP3s). 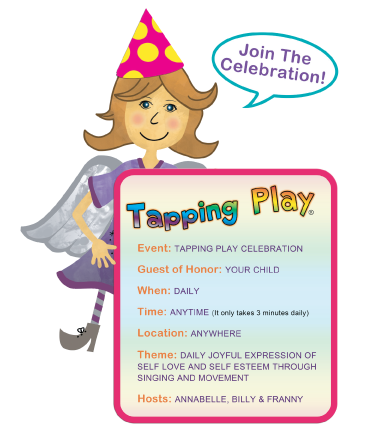 Each day, Annabelle, your free-spirited tapping guide, magically leads you and your child through the Happy Rainbow song of the day; while Franny and Billy joyfully show your child the corresponding color coded tapping points and song words. These up-beat songs of love and celebration have no age limit and ignite happiness and joy in everyone young and old. This daily practice roots your child in self love, love of their unique self expression, and love of life while anchoring them into embodied peace and calmness. Share this gift of LOVE and harmony with those special little beings in your life. This interactive gift of LOVE includes our vibrant Tapping Play® durable, spiral-bound book (8 1/2 X 11), animated DVD and musical CD. 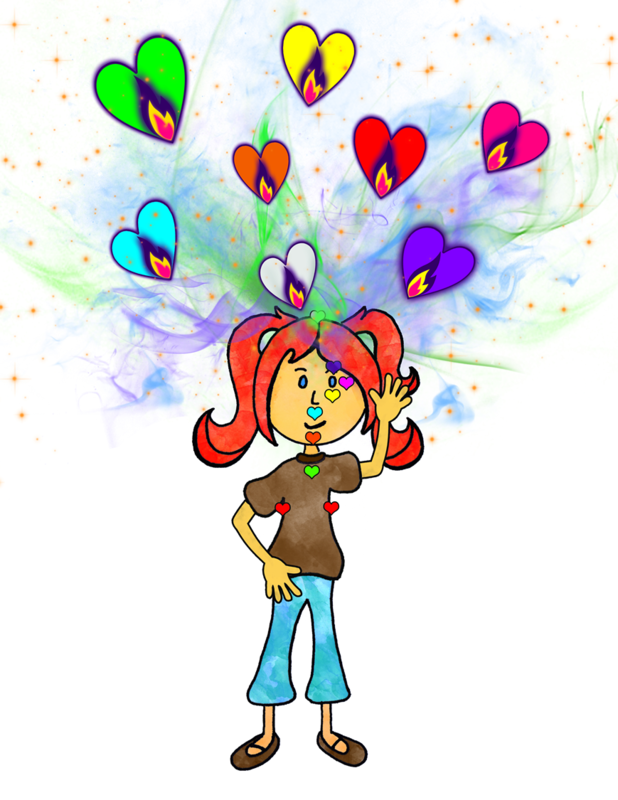 Each day, Annabelle, your free-spirited tapping guide, magically leads you and your child through the Happy Rainbow song of the day; while Franny and Billy joyfully show your child the corresponding color coded tapping points and song words. These up-beat songs of love and celebration have no age limit and ignite happiness and joy in everyone young and old. Meridian or Energy tapping is part of the Emotional Freedom Technique (EFT). Tapping on specific meridian points creates a more balanced state of calmness and wellbeing which can help reinforce our daily positive messages. Your child will deeply and completely love creating their happy rainbow day!